Immunohistochemical analysis of paraffin-embedded mouse brain tissue slide using 10904-1-AP (IBA1 antibody) at dilution of 1:800 (under 10x lens) heat mediated antigen retrieved with Tris-EDTA buffer(pH9). 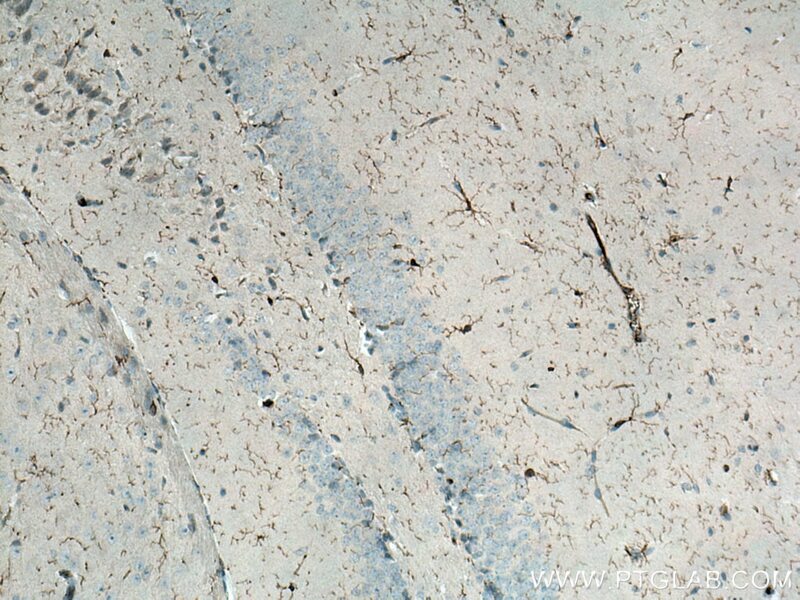 Immunohistochemical analysis of paraffin-embedded mouse brain tissue slide using 10904-1-AP (IBA1 antibody) at dilution of 1:800 (under 40x lens) heat mediated antigen retrieved with Tris-EDTA buffer(pH9). What is the molecular weight of IBA1? The molecular weight of IBA1 is 16.7 kD. Ionized calcium-binding adaptor molecule 1 (IBA1), also known as Allograft inflammatory factor-1 (AIF-1), is an inflammation-responsive scaffold protein expressed and secreted from macrophages. Microglia response factor (MRF-1) and daintain are also similar, and likely identical, proteins (PMIDs: 29749461, 9630473, 23792284). What is the function of IBA1? IBA1 is necessary for macrophage survival, and it is also a key molecule in proinflammatory activity (PMID: 29749461). IBA1 is a cytoplasmic protein, often expressed in immunocytes, macrophages, and microglia. It can be used as a marker for normal (not ‘dark’) microglia in brain tissue, as IBA1 is expressed by all microglial cell subpopulations (PMIDs: 29749461, 11943136, 26847266, 9630473). Is IBA1 upregulated in active immunophages? Yes; its expression is associated with inflammatory activity (PMID: 29749461). How do IBA1-positive microglia differ from microglia that express less or no IBA1? 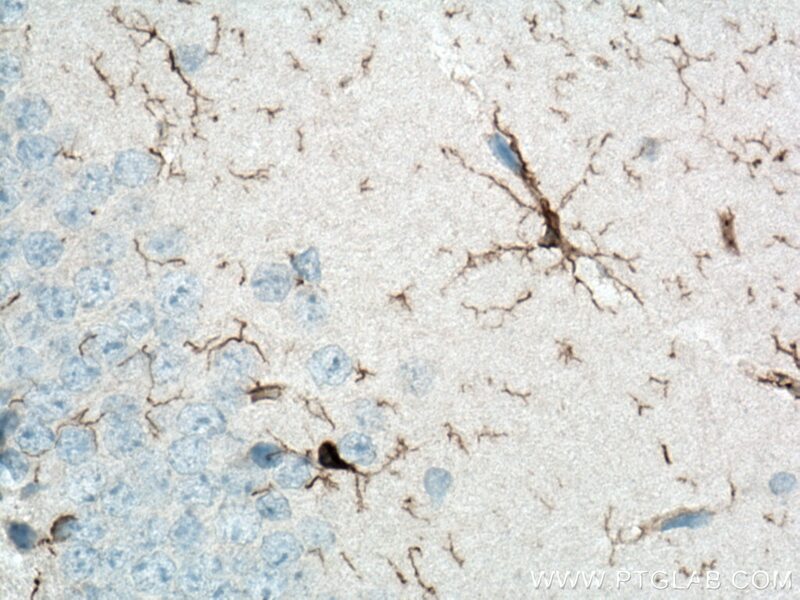 ‘Dark’ microglia is a recently described phenotype associated with Alzheimer’s disease pathology and chronic stress; these dark microglia express decreased IBA1 (often punctiform), and show distinct ultrastructural differences from ‘normal’ microglia as well as condensed and electron-dense cytoplasm and nucleoplasm. Normal microglia generally display strong, diffuse expression of IBA1. IBA1-positive microglial processes in normal conditions also have a strong tendency to exclusively contact synaptic elements, such as axon terminals, dendritic spines, and synaptic clefts (PMIDs: 29992181, 26847266). How is IBA1 related to Alzheimer’s disease and pain? Exacerbated immunoactivity of IBA1, particularly in proximity to amyloid plaques, is prominently featured in AD pathology. IBA1, along with other microglial markers, are also associated with pain, and robust microglial reactions often follow spinal cord injury (PMIDs: 29992181, 23792284). Daintain/AIF-1 promotes breast cancer cell migration by up-regulated TNF-α via activate p38 MAPK signaling pathway. Pharmacological blockade of CXCR3 by (±)-NBI-74330 reduces neuropathic pain and enhances opioid effectiveness - Evidence from in vivo and in vitro studies. Upregulation of allograft inflammatory factor‑1 expression and secretion by macrophages stimulated with aldosterone promotes renal fibroblasts to a profibrotic phenotype. Generation of apoptosis-resistant HEK293 cells with CRISPR/Cas mediated quadruple gene knockout for improved protein and virus production. Adenosine production by brain cells. Ketamine Alleviates Depressive-Like Behaviors via Down-Regulating Inflammatory Cytokines Induced by Chronic Restraint Stress in Mice.